Chomp is a simple game with a surprising mathematical twist. The rules are as follows. The bottom left cookie is poisoned. Two players take it in turn to "chomp" — that is, to eat one of the remaining cookies, plus all the cookies above and to the right of that cookie. So what is the winning strategy for Player A? Well, that is the mystery — nobody knows, at least not in general! The proof that there is a winning strategy for the first player was very simple — but didn't describe the strategy. It's a so-called non-constructive proof and nobody has ever been able to come up with a constructive version. For a sufficiently small grid a computer could of course work through all possible combinations of moves to find a winning strategy, but that's not a particularly interesting approach. More interesting are two simple cases where a winning strategy can be described: Square Chomp and Thin Chomp. Square Chomp is Chomp played on a square grid, and Thin Chomp is Chomp played on a grid that is only two squares wide. See if you can find the winning strategies in these special cases — or find out how if you get stuck. 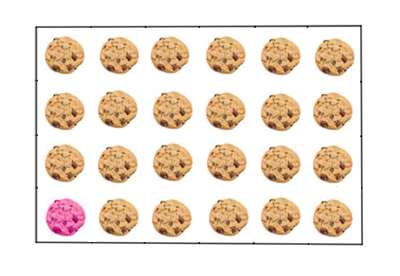 Player 1 (P1) eats the cookie just one row above and one column to the right of the poissoned one, leaving two "legs". 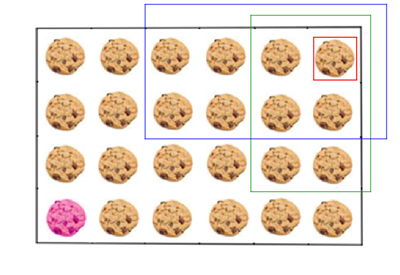 P2 picks to eat one cookie of one of the two legs, leaving say m cookies above (or to the right) of the poissoned one. P1 eats the corresponding cookie of the other leg, leaving the same m cookies on this leg: in this way symmetry is preserved. This evolves untill P2 leaves no cookies on a leg. P1 wins! Sorry... the proposed solution doesn't work for the "Slim Chomp"!